CoLD SToRAGE (birth name Tim Wright) is a Welsh electronic musician and video game music composer. He was born on July 31, 1967, in Cymau, Wrecsam, Wales. At the age of 23, he recorded his first successful soundtrack for Awesome video game. It was his real break. During the 1990s, he produced numerous tracks for different video games including The Killing Game Show, Lemmings, Shadow of the Beast 2, Armour-Geddon, Leander, Powermonger, Agony, Aquaventura, Sensible Soccer, Shadow of the Beast 3, Puggsy and Microcosm. In 1995, he released the soundtrack for WipEout, which contained 8 tracks. Now, you may download this album by CoLD SToRAGE in mp3 from our site. 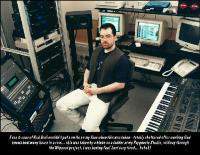 He continued the success with his following soundtracks for Krazy Ivan, Codename: Tenka and Colony Wars. Later, he organized the multimedia company, Tantrumedia Ltd., by himself. In 2005, he recorded hid first dance and hip hop album, MELT.